Later this year, the Barclays Center will open in Brooklyn. To promote the new sports arena, developer Forest City Ratner is paying the New York Metropolitan Transportation Authority (MTA) to add “Barclays Center” to the name of the nearby Atlantic Avenue-Pacific Street subway station. Although advertising in public transportation facilities is nothing new, selling naming rights to stations, cars, buses and lines is just beginning to pick up steam. Under its deal with Forest City Ratner, MTA will receive $200,000 per year for 20 years. In September 2010, the Southeastern Pennsylvania Transportation Authority (SEPTA) sold the naming rights to its Pattison Station in Philadelphia to AT&T. The five-year contract is worth more than $5 million and builds on efforts to generate more revenue aside from increasing fares, according to SEPTA. The agreement includes logos on the 21 vehicles and on three HealthLine stations. GCRTA also is selling 10 sponsorship packages — three of which have been bought — worth a total $7.5 million over the same time period. The money primarily is being dedicated to keeping stations clean and maintaining the corridor, including landscaping. One recent example of naming rights agreements came late last year when the Detroit Transportation Corporation (DTC) renamed the People Mover’s busiest guided rail station the MetroPCS-Greektown Station. 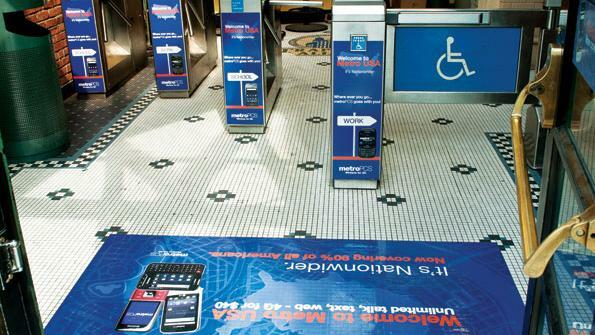 DTC had been selling advertising wraps on People Mover trains, which carry riders throughout the city’s downtown, for years. With one sponsor secured, DTC now is trying to attract other advertisers to name the remaining stations. — Jennifer Grzeskowiak is a Laguna Beach, Calif.-based freelance writer.